This continues our series on Thai massage in a seated position. The video shows work that’s used on an extremely common problem area, the upper back where it meets the neck. Levator scapulae are the muscles that go from the top of the shoulder blade to the base of the skull and they’re often tight and tense. The use of the elbow saves your hands, allows you to work effectively without strain. Share these with friends. They’re easy to perform techniques that post little risk when done in communication with those you’re working on. Ask those who receive from you how it feels. Better still show them how to perform it and trade. The best way to learn is to give and receive. 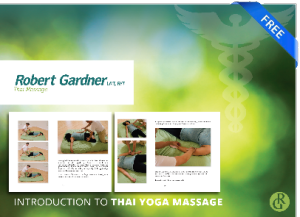 See you soon for a Thai massage class here in Austin, Texas.